A Shadow Wedding is an intimate ritual held before a regular "light" wedding in which all manner of difficult material between the couple is welcomed. It provides a consecrated place for partners to give voice to their darker sides, along with any doubts and fears about committing to lifelong partnership. Through the process of creating and participating in a Shadow Wedding, partners choose one another with eyes wide open, seeing ALL aspects of their beloved. We — Jim Benson and Jessica Wolk Benson — led ourselves through our own Shadow Wedding in 2010. We've since become inspired to share this powerful work with others. As a Professional Certified Coach and a Licensed Marriage and Family Therapist, we've created a safe and transformative process to support engaged couples through their own Shadow Wedding experience. Why do a Shadow Wedding? Picture this: Beaming with love, a beautiful, serene bride in a stunning white dress gracefully makes her way down the aisle. A handsome, confident groom stands smiling from the altar, gazing purposefully at his bride as he watches her approach. Faces of family and friends shine in ear-to-ear smiles, some eyes fill with tears. Vows are spoken, rings are exchanged, and a kiss is met with happy applause. The setting is pristine, with gorgeous flowers, fantastic food, great music, and well-satisfied guests. The whole event goes off without a hitch. Except there is a hitch. The full spectrum of a real wedding experience, and of a real relationship, is far more multi-dimensional than these glossy images. When we marry one another, we marry all of our beloved, the light and the dark. This idealized scene omits any of the murky aspects of getting married — underlying relationship dynamics, family challenges, fear of commitment, doubts about each other — not to mention the stress and chaos involved in creating the actual wedding day. The Shadow Wedding ritual offers an alternative to the one-sided wedding experience. Held with love, levity, and gentleness, the shadow is genuinely welcomed into the conversation. With our guidance, the Shadow Wedding experience invites the brave and willing to safely explore and express their own underbelly — first to themselves, then to each other, and then to members of their community in a separate Shadow Wedding ritual. Sound intense? Understandably, many engaged couples may shy away from doing this edgy work. But we believe if couples can find the courage it takes to address the shadow in their relationship, they stand a better chance of weathering the challenges of living in a fully committed relationship. There's no need to return your dress or cancel your tuxedo rental! The Shadow Wedding experience goes hand-in-hand with your light wedding plans. And we do not wish to diminish the significance of traditional weddings — our own was the single most love-infused day of our lives. Instead, we aim to provide balance for the "skew to the light" our culture and the wedding industry have imposed upon marriage. 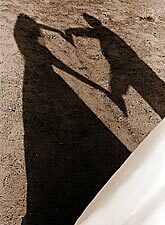 So as you are planning and preparing for your wedding day, we encourage you to plan for your Shadow Wedding, too. With us as your guides, transforming the shadow of your relationship just may be the most enduring wedding gift you can give to each other. Learn about the basic components of a Shadow Wedding. Contact us for a free Shadow Wedding consultation. "To be fully seen by somebody, and to be loved anyhow — this is a human offering that can border on the miraculous." Contact us for a free consultation, in person or via Skype. We welcome couples of all sexual orientations. "The Shadow Wedding is a pioneering, bold offering. Jessica and Jim invite couples below the sun-bright rooms filled with the best of who they can be together into the darker undercurrents of the marriage contract. They provide an excellent roadmap and safe holding environment for couples to forge a relationship between the light and the dark within themselves and with each other. "Addressing the dark side of the marriage contract along with the light will do much toward restoring the possibility for meaning, direction and joy in marriage for those courageous enough to do this work." © 2011 Jim Benson and Jessica Wolk Benson. All Rights Reserved. Shadow Wedding (TM): Bringing Light to the Dark Side of Getting Hitched. or by phone at (415) 455-8985. Is a Shadow Wedding for You?